Ingrown Toenail Pain Relief Treatments Dr. Silvester discusses the common problems of ingrown toenails. Painful ingrown toenails can make each step a misery. From the time you get out of bed to the last step at night, the discomfort is a constant reminder that something has gone terribly wrong with your nail. No one is safe from a toenail growing into the nearby skin—this is not just a problem with children’s feet. In fact, many adults experience this common foot ailment, which most often impacts the big toe. There are many reasons that the nail plate begins to grow abnormally. For most, it begins with trimming the nail too short or with rounded corners. Other people are hereditarily predisposed to ingrown nails, or wear shoes that are too short and narrow. Unfortunately, sometimes trauma can also precipitate a future ingrown toenail. An ingrown nail is usually a recurring problem. Once you get one, these seem to hang around. especially if your skin begins to grow over the ingrown nail. Poorly fitted shoes can put pressure on the soft tissue around a toenail causing it to push up over the nail and inducing an ingrown toenail. 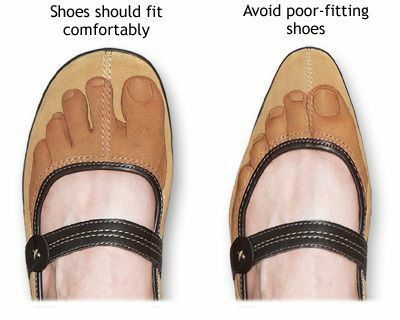 Also, if poorly fitted shoes are worn for a long time, the can actually deform the nail. Poor cutting techniques are another culprit. While trimming nails short seems like a good idea, it can be very problematic. 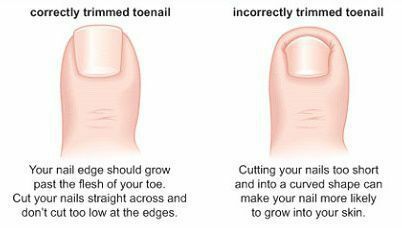 Cutting the nail without cutting off the edges helps keep the skin where it belongs on the outside of the toenail. 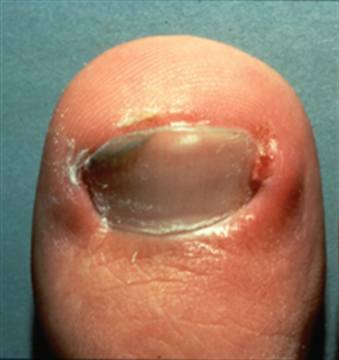 Once the skin gets up in front of the nail, the toe starts to hurt and swell and the ingrown toenail just gets worse. Our choices are only part of the story. Fungal infections, injuries, and genetics also play a role. Stubbing a toe not only makes you hopping mad (quite literally), it also can result in a toenail that grows incorrectly. Some people are prone to this type of nail issue, because of the natural curviness of their toenails. If this is the case, it is important to be very vigilant so that problems can be addressed quickly. Examining your feet every day will keep you one step ahead of common foot conditions. However, with a toenail that is ingrown, you may feel it before you see it. A tender toe begs to be heard, so don’t ignore the discomfort—check it out. Upon examination, you’ll likely see red, swollen, and inflamed skin around the nail. Look closely for signs of infection including drainage or red coloration that seems to be expanding. WARNING: People with poor blood circulation for any reason, including those with diabetes, should contact our office right away. Ingrown toenails and diabetes do not mix, and what starts as a small problem can quickly lead to severe infection. Even if your feet are otherwise healthy, an infection caused by a nail that is ingrown can eventually lead to loss of the toe or even worse. Choose shoes and socks with ample toe space, don't cut the corners down on the sides of the nail, and watch for signs of nail trouble. Even with the steps, sometimes ingrown toenails keep coming back. Unless you see signs of infection, you can begin treating the problem at home. Give your foot a warm soak to make the nail soft and try and lift the edge with something like dental floss or a small nail tool. To secure the cotton in place a single drop of super glue can be helpful. This can also soften the nail. People with diabetes, peripheral vascular disease, or other circulatory disorders probably should avoid any form of self treatment and seek treatment by a foot specialist immediately at the first sign of an ingrown toenail. Most of the patient's that come to see us with an ingrown toenail have been putting up with it for some time and just want it out of their lives. Most people also have heard horror stories about the treatment of an ingrown toenail in a doctor's office or emergency room. Many of the patient's that come to see us have experienced a painful, unsuccessful or traumatizing treatment prior to coming to us. Don't be afraid. We have developed several techniques to make getting rid of your ingrown toenail a nearly painless experience (check out the videos below). We do this procedure nearly every day and often many times a day. All this experience has taught us ways to get you through the experience without a lot of unnecessary pain or fuss. Also, most of the time, you end up with a toenail that looks almost entirely normal. This procedure is called a partial matricectomy. It is also usually a permanent solution to ingrown toenail problems. Do Injections for Ingrown Toenail Surgery Hurt? Is It Painful to Get an Ingrown Toenail Removed? I had an injection for an ingrown toenail and it didn't hurt. If you don’t see improvement, or if your condition worsens, contact Next Step Foot & Ankle Clinic for an appointment right away. Dr. Darren Silvester can separate the nail and skin, evaluate whether or not an antibiotic is necessary, and in serious cases, determine if part of the affected nail should be removed. End the pain of an ingrown toenail today. Call (830) 569-3338, or request an appointment online to visit our San Antonio or Pleasanton, TX offices.